Today we were driving up a mountain road when one of the boys said, "There's a butterfly!" I stopped and we piled out of the truck to see our first butterfly of the year. 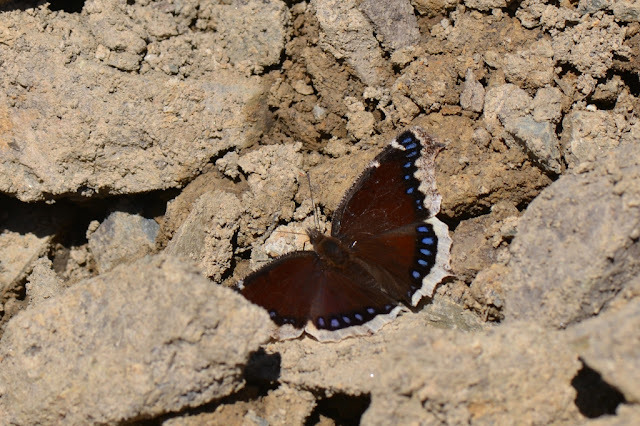 A Mourning Cloak Butterfly was flitting around a shale pit and alighting on the disturbed, moist ground. Butterflies in early spring.... a pleasant sight! Mourning Cloak Butterflies overwinter as adults and can be seen flying on pleasantly warm winter/early spring days when very few other moths and butterflies are around. Today was pleasant.... in the upper 50's... and I did see several Mourning Cloaks, but I was also saw an Infant Moth (Archiearis infans) that went zipping around the shale pit as if it was a skipper. This small, active moth sure didn't act very moth-like. Here's a photo of this early spring-flying moth... I didn't get good pictures of it because it was fast and uneasy about me. This moth obviously overwintered as an adult and I'm sure there's not very many species of butterflies and moths which overwinter around here in Pennsylvania. Perhaps that's why encountering these spring butterflies and moths was such an outstanding experience. Lovely sign of spring and the summer to come. I saw some Mourning Cloaks in more natural habitats but didn't get chances to snap pictures... I hope there are other signs of spring that aren't so camera-shy.